Founders’ backgrounds: Michelin and Dunn previously started Finchatton, an international property design and development firm, in 2001. CEO Rajah has launched and developed fintech products for the last ten years. CapitalRise is an online property finance marketplace that gives individuals and institutions access to the finest real estate investment opportunities with returns of eight to 12% per year. Each opportunity is carefully selected and offered to our investors, paying out returns once the developments are completed and the properties re-financed or sold. There are no fees to invest, it’s tax free via the CapitalRise ISA, and the minimum investment amount is only £1,000. Returns are market-leading – the first project, which closed in December 2017, achieved 14% returns over a 17-month term. Developments funded to date include properties in Eaton Square, Grosvenor Square and the Strand. The kind of developments we specialise in, and the level of returns that they offer, would ordinarily only be accessible to people with millions to invest. Our model allows individuals to invest at a level that suits them – anything from £1,000 upwards – in some of the finest developments, predominantly located in prime central London. With interest rates at a historic low, investors are increasingly looking to alternative options that deliver strong risk-adjusted returns. We believe we’re striking that balance. Property is considered to be a low-risk, long-term investment and by opening doors to investors in this market, removing the middle layers and charging no fees, we provide simple, direct access to a number of very exciting investment opportunities. 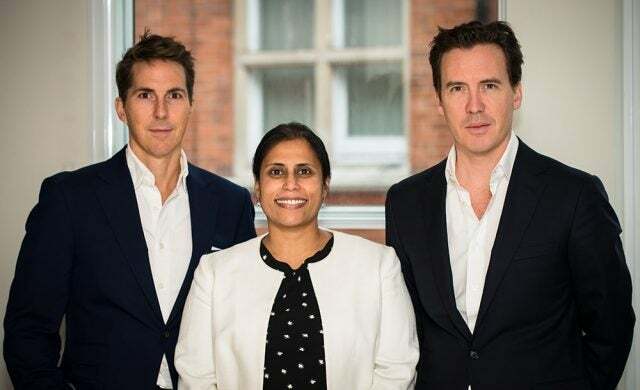 Having recently completed our first investment project, a multi-million pound property in Eaton Square, we paid 14% returns to our investors over a 17-month term. Investors across our projects are earning an average return of more than 10% per year. As well as giving investors access to opportunities that were previously not available to them, CapitalRise completes the picture by providing developers with smart property finance. From our experiences with Finchatton, we knew that one of the biggest challenges facing property developers is accessing quick, reliable, secure, yet bespoke finance for their projects. CapitalRise is filling a gap in the real estate funding market for financing below £10m, a loan size too low to be attractive to banks and other traditional lenders. We provide both debt and equity funding, so developers can fund a project from us as a single source. Yes, we are currently seed funded by the co-founders. We are truly passionate about our product and, as founders, we also invest our own money in every project we put on the platform. We want to show our investors we believe strongly in every project we list. What were you doing before you started CapitalRise? Michelin and Dunn, friends since school, launched Finchatton in 2001. Since then, the property design and development firm has completed more than 120 projects around the world, with a total value of more than £1bn. Before that, Michelin worked in corporate finance for HSBC, first in investment banking and then in private equity. Dunn’s background is in investment management and property development. The idea for CapitalRise came out of their frustration at the challenges that property developers face when trying to secure financing for projects. Michelin and Dunn spotted a need for someone to provide quicker and better-value finance to developers, filling a gap between individual lenders and banks. They felt that the internet provided the perfect way to match investors with property borrowers and banks and create a market-leading solution. Prior to CapitalRise, Rajah spent ten years gaining valuable fintech experience, most recently at Wonga, where she was employee 21. As head of product she launched and developed consumer, small and medium enterprise, and P2P lending products. Before that, she spent ten years at Mars Confectionary in a number of management roles, focusing heavily on product innovation, and holds a MEng from Cambridge University and an MBA from Insead. Being one of the largest and most active real estate markets in the world and a global hub for technology, London is the ideal location for us. The majority of our investment projects are on our doorstep in prime central London, so it allows us to provide regular first-hand updates to investors. We are able to hold exclusive events for our members at the properties – such as at Yeoman’s Row, a £22 million townhouse in Knightsbridge. What we build here in London, we hope to be able to replicate in other leading cities and real estate markets across the world. Need to know more about launching in London? Read out free guides to running a business in the capital here.